This is what I do when I'm not knitting and spinning. A couple of years ago, when Caleb was small and I was at the end of my rope, I took a jewelry making class from The Austin Museum of Art (we lived in Austin then), it was either that or join the circus. Anyway, I loved the class, learned a lot and still enjoy making jewelry. 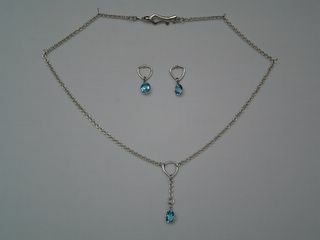 The set above is Sterling Silver with Blue Topaz. It is available for sale. The stones are 8mm x 6mm, the necklace measures 17 inches around with a 1-1/2 inch drop. The earrings are 1 inch in length, which is a nice length: not too small to get lost in long hair but not so long that they'll tangle in your hair either. The Blue Topaz is the bright "Swiss" color. All jump rings are soldered closed and as I said, all metal is Sterling Silver. I've priced the set at $120, and for that price I'll include a polishing cloth and free shipping anywhere in the Continental US. Drop me an email if you're interested at: HooLooBooataoldotcom (replace the bold words with the appropriate symbols, I'm trying to avoid spammers here), also please mention jewelry in the subject line so I know what you're emailing me about. Thanks for looking. Tomorrow, what do elephants have to do with knitting? Remember the Romney lamb and Alpaca handspun that I Wilton dyed each ply separately? 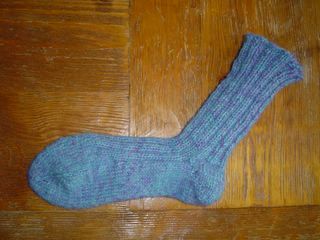 Here is one sock from it. I'll start its mate later today (you know, two feet, two socks, etc.). The toe looks kinda poofy because I got bored of stockinette stitch and started ribbing on the top of the foot. I'm really happy with the way the colors worked together in this yarn and the socks are so soft! Someone will have to come up with tactile computer monitors. Knitter's alone would probably keep the demand for them going strong. Who knows what other groups would be interested in touching the pictures on a computer screen. Um, actually, maybe that's not such a good idea. OK, everyone just use your imagination about how soft these socks are. In other news, I've also started Navajo plying the Easter Egg sock singles so I'll have that to show later this week. Also, I've been having some problems getting pictures to show up sometimes, I don't know why, but sometimes I get a little square with a red X in it. That's not what I'm trying to share with you, so bear with me while I try to figure this out. See what I started this weekend? 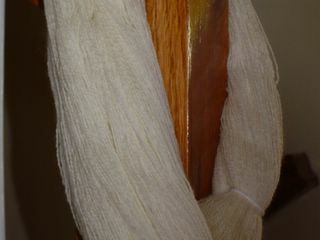 Its a Feather and Fan wrap from the laceweight Coopworth. I don't have a white wrap and I think this will be nice for Spring and Summer. They don't really show up very well, but if you look closely, you can see the Amazonite stitch markers. Why would I send a laceweight shawl knitting project on vacation just to start a laceweight wrap, you ask? Well, the wrap is autopilot knitting, the shawl is definately not. Besides, I can knit what I want to. HA HA .In other news, Caleb's ear infection (the one we've been fighting for over a month and has switched ears several times) is finally gone. YEAH!! I made some stitch markers today. These are for a project I'll be starting this weekend. 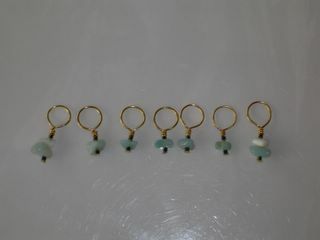 They are Amazonite with some dark blue green seed beads. The ones at the end also have a piece of Mother of Pearl above the Amazonite. I have also come to an important decision (drumroll please)...the Peacock Feathers Shawl is going to have a little vacation. By itself. Its really a beautiful shawl, the chart isn't difficult to read, its not hard to knit. Its just driving me nuts. I feel like its hanging over my head making me knit it, so naturally I don't want to. So this morning I got it a ticket to the bottom of my knitting bag, gave it a nice trashy romance novel to read and some snacky food and sent it on its way. I feel so much better. I'm going to enjoy something else for a while and then we'll see about the Peacock. I think part of the problem is that the color is a dark green, which I have no plans to wear for 6 or 7 months. I want Spring colors, lighter colors, fun colors...not dark colors. So, Peacock, have fun, send a postcard, buy a goofy T-shirt, and don't drink the water; I'll see you when you get back. Bon voyage! I've spun the singles for the first Easter Egg Woolie sock. I was going to go ahead and Navajo ply it before I spun the second sock's singles (say that five times fast), but then I realized that if I went ahead and spun another bobbin for the second sock, I wouldn't have to set up my wheel for plying twice. It was a moment of rational thinking in my otherwise irrational world. Not that setting up the wheel for plying is difficult, it just takes a little time. I've been reading the Color in Spinning book more and have some other ideas for the cool color socks from my Easter Egg dying. I have to say, that book just blows my socks off. I have taught color theory to quilters before and I'm comfortable with most of the concepts used with color, but wow! She (Deb Menz) has soooo much information in that book! The book is definitely worth the price for the pictures alone: total eye candy, but if you're a spinner, even if you never want to dye your own fiber, you'll still learn things that you can use to make your colors more interesting. Sorry to go on and on, but its just such a great book! I'm going to try to motivate myself to work on my Peacock Feather Shawl today, I know you all can't wait to see it (said with much sarcasm). 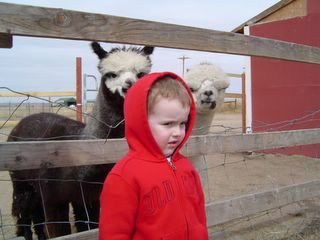 Caleb with Tacoma (on the left) and King George. Caleb with Darice and BJ, feeding Cody. Isn't she just the cutest alpaca you've ever seen? This is Phoenix and she's about 6 months old. 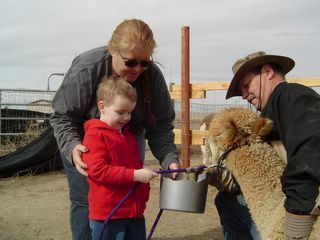 Purple Sage Alpacas is owned by Darice and BJ, who very generously opened up their farm so that we could come see their beautiful animals. We spent a great afternoon feeding them carrots (the alpacas, not Darice and BJ) and actually got to pet some of them, but it was wonderful just seeing the alpacas. 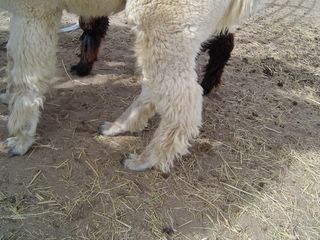 I love knitting with alpaca but its so much more fun to see the fleece "on the hoof." I bought Tacoma's prime fleece from last year's shearing (the dark rose grey alpaca with the white face, standing behind Caleb above) and it will be sent off for processing very soon. 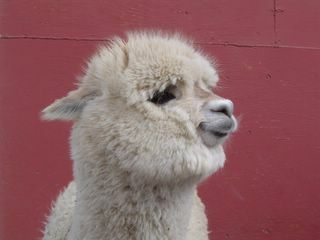 After all, I couldn't go to an alpaca farm and walk away empty handed could I? That's just sick. Caleb also had a blast but he loves all animals (except the ones that bite - he has a detailed list of animals that bite and will happily fill you in on those if you're interested). At least two of the ladies in the first picture are pregnant right now and it may be more than two. The girls were a little bit jumpier than the boys were, so most of my good pictures are of the boys. Purple Sage Alpacas doesn't have a website at the moment but if anyone is interested in contact info, I can get that for you, just let me know in the comments. I know they have some other fleeces from last year that are available for sale. We're back! Caleb and I went to Colorado Springs, Colorado last week to see family, but of course we squeezed some fibery fun in too. 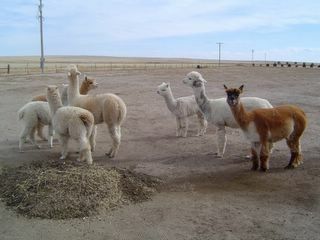 Table Rock Llamas is a fairly new fiber shop north of Colorado Springs in the Black Forest area. They carry spindles, spinning wheels, and looms, as well as all types of fibers to spin. They also have some knitting supplies and carry a large assortment of natural dyes. As you can see, I did a little shopping. 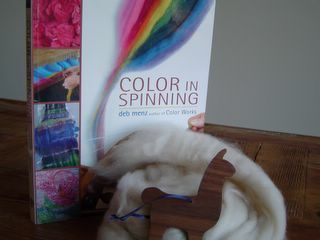 I picked up Deb Menz's new book, Color in Spinning, and boy does it have a lot in it. I also found this cute little llama ornament carved in walnut and I got 1 ounce of Mongolian Cashmere Top: yummy, yummy! I'm working through the pile of laundry and getting the house put back together now, but tune in tomorrow for.....Purple Sage Alpacas! We went, we fed, we petted these gorgeous critters! Finally finished spinning the Coopworth laceweight. This is 765 yards of two ply. I felt like I was never going to get this finished, even though there is less yardage (and weight) than there was of the pink roving back in February, it just kept going and going and going. I'm so happy to have it done and it really is gorgeous. If I ever finish the Peacock Feathers Shawl, I have plans for this to be a stole, probably the Feather and Fan pattern. 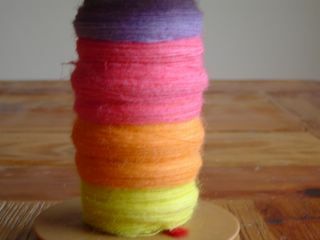 Once I got this off the wheel, I started spinning my Easter Egg woolly roving and it is looking really nice. 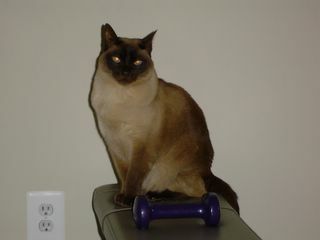 I'm going to be "out of the blog" until next Monday, so I'll show you what it looks like then. Hope you all have a great week and let me know if Spring comes to where you are, I mean, it has to come doesn't it? It can't not come, can it? There are no Peacock Adventures. Remember a week ago? This is 5 rows more. Can you believe the speed I'm going on this thing? In an effort to make it more interesting, it is reclining on a pillow instead of laying on the floor, and its turned purple. Sorry, folks, I don't know how to make it more interesting. I'm afraid to take it places because I know its just waiting to get out in public and jump off the needles and run away. If I were to catch it, we all know the silly thing will ravel back 20 rows and somehow turn the pattern wrong side out and backwards. So you are stuck with a purple Peacock Feathers Shawl, going nowhere fast. Enjoy! Don't you wish this would show up in your Easter Basket? 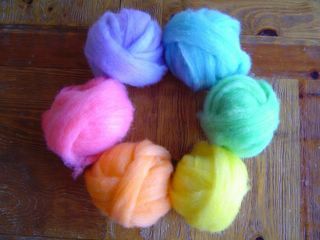 This is eight ounces of Coopworth roving that I dyed with Easter Egg Dyes. This is the first time I've used Easter Egg Dyes and it was so much fun, I'll definitely be doing it again. I'm so happy with the way the colors came out. 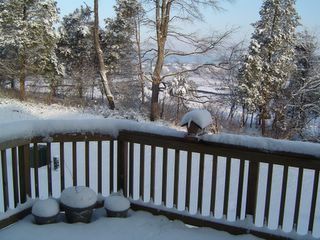 It was just what I needed yesterday, watching the snow and the wind outside. I'm thinking about dividing the colors up some when I spin them, then Navajo plying and making stripey socks with it, but I haven't decided yet. For those interested, each little roving ball is about 1-1/3 ounce of fiber. I used one tablet of the dye, added a cup of vinegar and let it dissolve. Then I added 2 cups of water and poured the mixture over the roving which was in individual pyrex dishes. I squished the roving around and flipped it over (very gently), then covered it with a piece of parchment paper and popped it in a 225 degree oven for 45 minutes or so. It was very easy to do. I assume that adding more wool would make the colors lighter and adding more dye/less wool would make the colors darker. I'm going to have to try it again with some light brown wool, just to see what happens to the colors then. Lookie what I did yesterday! 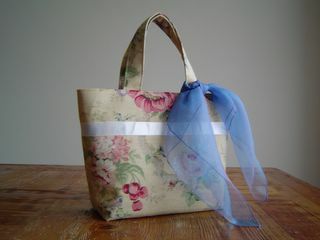 I'm tired of carrying my Winter purse, so I made one for Spring. Let's not talk about the snow and 40 mph winds outside right now, lets just look at the pretty flowers and happy colors, shall we? What you can't see is the periwinkle blue lining inside the handbag. It matches the scarf tied to the handle, so you can use your imagination there. I was so excited when I remembered about that scarf (which I never wear) and saw it would go with the handbag fabric. What does it mean when my accessories have accessories? Should I be worried? This is my fourth attempt at posting a picture of the finished BBC (Boring Black Cardie) to the blog. If it doesn't take this time and all you see is a little square with a red X in it, I'm sorry, just use your imagination. 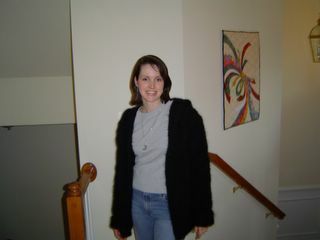 Its a long, black, hooded cardie with roll back sleeves. Yes, I am feeling a little snarky right about now, thank you. See what Caleb's holding? I'm almost finished with the back of the BBC! 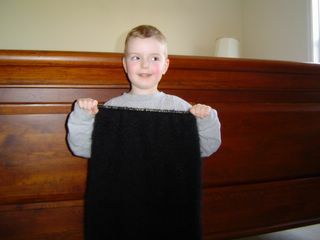 I have just 8 more rows, including shoulder shaping and the back is finished. It will be finished tonight and pinned out to block. I hope to finish the sleeves tonight too, then I only have the hood to knit, sew it together, add the button, and tune in Monday for a Finished shot of the BBC! Also, there is BIG NEWS here at Pink Lemon Twist. PINK LEMON TWIST IS AN INTERNATIONAL BLOG! Yeah, yeah, I know WORLD wide web and all that, but yesterday I got visited by The Canadian Knitting Goddess, The Wool Pig herself....THE YARN HARLOT! That's right, look in yesterday's comments, the one comment there, its from Stephanie! I'm having a total Wayne and Garth moment here (we're not worthy, we're not worthy). Mickael, poor thing, just doesn't get why I'm so excited here. I keep trying to explain it to him but he doesn't understand terms like "Knitting Celebrity" and "Queen of the Latvian Mittens for People with Three Hands." (If you're not a regular Harlot reader, there was this incident with some gorgeous Latvian Mittens involving two right hand ones, it was heartbreaking and tragic, she had to knit one for the left hand). Anyway, huge news here going into the weekend, have a great one! 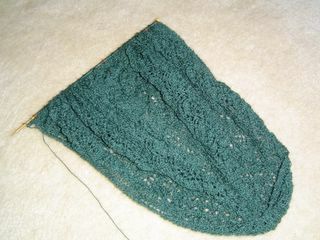 The Peacock Shawl is now 310 stitches across. I only have to add 185 more stitches over the next 94 rows and then I'm done! That's right, only 94 more rows to go, then I can get this off the needles, block it to death and actually see what I've knitted. Each right side row is only taking about 30 minutes to knit right now so I figure it should take me another 6 years, 4 months to complete. As you can see, its getting bigger and harder to spread out - actually, I didn't even try today since last time it barely fit on the two needles. If you want to see what it looks like spread out, blocked, finished and beautiful again, go here. Notice you can also buy a kit and make your own/drive yourself bonkers along with me! If you're not a blue or green kind of person, I found a really great picture here, about halfway down the page. Aren't those pinks and coppery colors great? Totally not the colors I think of when I think about Peacocks (we won't discuss the things I think of when I think, "Peacocks" right now, this isn't that kind of blog) but there he is, wearing those colors. Since I doubt you want to hear me rant again this week, and there's not really much to see, I'll give another Peacock update next week, with more peacock colors and maybe some interesting something or other about peacocks to distract you from the miniscule progress I've made on the shawl. Ramius would like to remind everyone to put down your knitting needles, stop the spindle, get up from the wheel and do a little exercise. If we don't take care of our bodies, they won't take care of us. 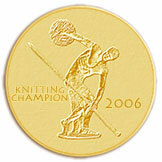 Then when your done, head over to MagKnits and check out the Warm 2005 edition. They've got a cute shaped Tee Shirt and a felted bag as well as some other fun stuff!